At the CES show in Las Vegas, Ion Audio announced two new iPod products, iCapture and Anyroom. 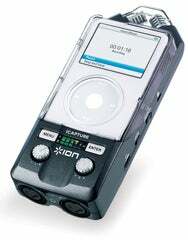 The Ion iCapture is a stereo audio recorder. The device is designed for handheld recording of music, interviews, lectures, and so on. The user's iPod docks in the recorder, which has a built-in stereo microphone, and features a custom faceplate to protect the iPod while allowing access to its controls. You can listen to the recorded audio on the iPod or transfer it to a computer or other device. iCapture is powered by batteries or using a wall plug (when plugged in, the dock can recharge the iPod as well). Ion expects to ship the iCapture in Q2 2009, but hasn't announced a price yet. Ion's Anyroom is a wireless, multi-room speaker system for iPod. The system uses a microTx transmitter dongle that connects the iPod to two stereoRx modules. You can place the speakers in separate locations up to 600 feet apart. The iPod controls the speakers like a wireless remote—you can control music playback, change volume, and adjust the left and right channels. The transmitter connects to the docking connector on most iPods and is small enough to fit inside the users pocket. Anyroom should be available in Q2 2009 for $200.